Graphic Designer wanted to convert ugly text PowerPoint into a beautiful, exciting, tech-themed PowerPoint. What I want is a product that looks like it came out of a magazine. Attached file is the ugly text PowerPoint. I don't want it to look anything like it does right now, so please only use the file as a guide to the text that should be on each slide. 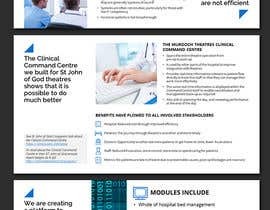 The PowerPoint will be used to sell technology-based process optimisation to hospital CEOs, so needs to be technology-themed, with lots of health care theming also. Ideally you will create something that looks like it came out of a magazine. Perhaps check out the video links in the presentation, they'll give you some context around what it is we are trying to sell. Although I need the output in PowerPoint format, I don't want it to look like the average PowerPoint (i.e. same design on each slide, emphasis on lists of bullet points etc). It needs to have visual variety. Sir you don’t like my entry that is because of pic in it or the font ? I'm sorry, but I thought you missed the point in general - it wasn't attractive enough, and didn't seem to understand the brief. Hi there, would you mind to tell me why rejected my presentation #27? Just want to improve the services, thanks. please take a look at entry #23. thank you. I need a file in PowerPoint format. I need it in this form because it is likely to be integrated with other PowerPoint content, and because I want to be able to modify the wording easily. I hope that's clear, I'm not sure if I'm answering your question. I'm aiming for something that looks like it comes out of a magazine. A glossy brochure. I want the output in PowerPoint file format, but I want it to look like it came out of a magazine. Guys thanks for some great entries so far. People have done good work with backgrounds and icons. Very few people have been able to do anything with the text though. I'm thinking that some of my lists of bullet points could be converted into different size fonts and spread around the page, or made into a hub with each bullet point sitting at the end of a line coming out of the hub. Just about anything that isn't a list of bullet points and that makes it all look a bit more exciting. Hope that helps! Please set submission format to .pptx. I'm sorry, but I don't seem to have an option to change this setting - it is displayed on the contest set up page, but I'm not able to change the formats listed there. Will this prevent you from completing the task, or prevent me from receiving a final version in PowerPoint? 5 would be my preference, but if you think you can present the key messages more clearly then anything up to 8 would be OK. I can make you a beautiful powerpoint but I need to make about 20 slides. Is that okay? Please let me know. How to show you the presentation as the entry accepts only image files for upload? Hello, please wait for my entry.